Over the past ten years approximately 450,000 houses have been built with steel framing in the USA. It is fore casted that it will only be a few more years before the next 500,000 homes are built using steel. Rebuilding the hurricane-ravaged Gulf Coast region will be a big effort and it has created an unexpected opportunity for the steel framing market. This is not just due to the increased strength and durability of steel, but also to termites. 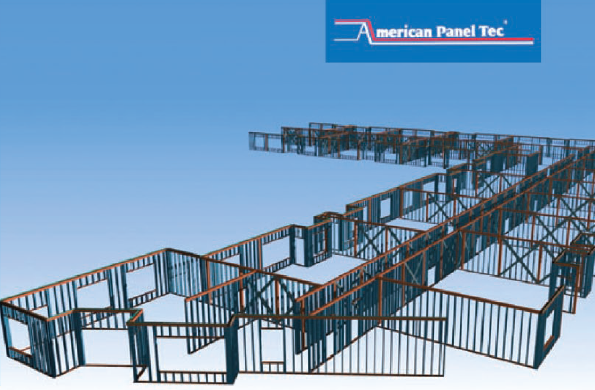 American Panel Tec was established in 1989 with the aim of bringing a new level of performance to the steel framing industry. This performance was achieved through the application of advanced computer technology, quality control techniques, and an unfailing commitment to excellence by experienced staff. At the core of the products is the Light Weight Steel Framing System (LWSF). Originally conceived as a product to replace wood in single family homes, through engineering and technology its capability and use have been expanded to include Load Bearing for mid-rise buildings, such as multi-family housing, dormitories, shopping centers, assisted living facilities and nursing homes. American Panel Tec delivers wall panels, floor panels, roof trusses and other building components to the builders. This technology enables builders to reduce on—site construction time, gain better control of the job schedule, reduce waste and clean-up requirements, and increase profitability. 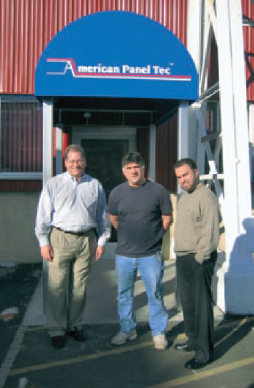 American Panel Tec has been using Argos Framer for LGS since 1997. When switching to Vertex BD Framer for LGS in 2006, other software like AutoCad was reviewed as well. They chose Vertex for its unparalleled framing capabilities. “As the framing rules are pre-deﬁned, the panel drawings with cutting lists and bills of material are created automatically. For our normal project, instead of 4-5 weeks with AutoCad and traditional panel designing, the panel design is ﬁnished in 1-2 weeks with Vertex BD Framer,” claims Mr. John Lanzilotta, the president of American Panel Tec. “Each project is designed to customer speciﬁcations. We incorporate all of the appropriate floor, wind and snow loads along with the seismic requirements to ensure the structural adequacy of the building. Vertex BD Framer allows us to quickly and efﬁciently convert the plans into an effective panel scheme, the technical portion of our package for customers involves preparation of PE sealed shop drawings, engineering calculations, panel drawings and panel layouts,” Mr. Lanzilotta says. system can easily be adjusted to meet each company’s speciﬁc building details and procedures. It automatically places all framing components, cormer details, backers, headers and other details, while maintaining the ability to modify any framing component in the project. Vertex BD Framer produces all necessary manufacturing and working drawings including detailed cutting lists in custom deﬁnable formats, and can even optimize cutting lists based on available stock material lengths.